Home › Crew Supply Vessel › Fast Crew Supplier › Fast Crew Supplier 3307 Security › Fast Crew Supplier 3307 Security "Guardian 1"
Fast Crew Supplier 3307 Security "Guardian 1"
Homeland Integrated Offshore Services Limited (HIOSL) has taken delivery of a Damen FCS 3307 Patrol. 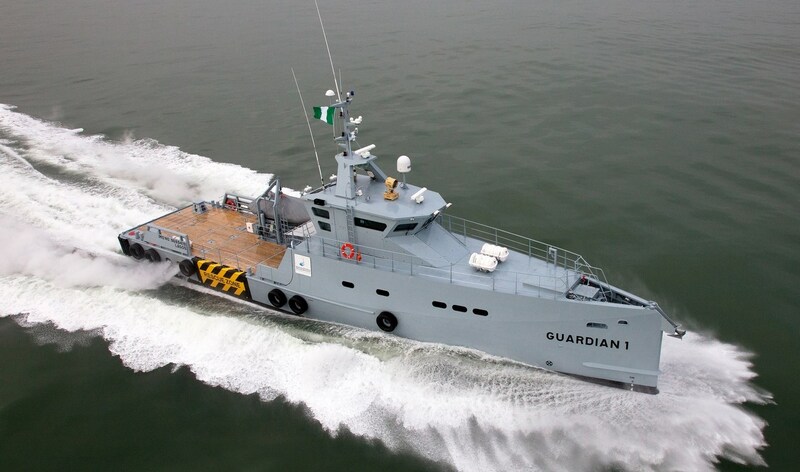 Guardian 1 will be used for maritime security purposes, crew transfers and supplying cargo and provisions. The Damen FCS 3307 Patrol has the pioneering ‘Sea Axe’ bow that gives the vessel unparalleled seakeeping behaviour, even in challenging conditions. The 30 knts vessel is extremely fuel-efficient and can also transport cargo on its aft deck to the offshore rigs.